If you are anything like a large percentage of the world’s population, the following question crosses your mind more often than not, “What can I do to be healthier?” There are a million responses to this question. Some will say, exercise, do yoga, meditate, don’t eat carbohydrates, walk to work, watch less TV, do crossword puzzles, travel, hang out with friends, etc. The possibilities really are limitless. One thing that is limited is our time. There are only so many hours in the day, so we find ourselves saying, what is just ONE simple thing I can do to be healthier, that is quick and easy? 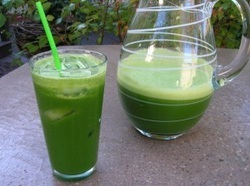 There are numerous things, but the number one thing I recommend to my clients is to start blending their greens. We have all heard of the infamous wheat grass shot, we know it is good for us, but it sure tastes like we imagine fresh cut grass after mowing our lawn would. This is based on the same principles but a tad tastier. Blend greens into a smoothie once a day. Add everything you would normally to a smoothie, and then throw in a handful of spinach, kale, or collard greens. Greens are however a little bit bitter by nature and some are even spicy. When you are blending, try to have a 60/40 ratio. That is 60% ripe fruit to 40% greens. The ripe fruit will sweeten the drink to make it palatable to even the tiniest family members. I encourage you to stay away from the spicy greens as their flavor tends overpower the fruit with which it is blended and when in doubt add a banana, it makes everything just a little bit sweeter. Why greens you may ask? Greens support detoxification in the body all the way to the genetic level. They have been linked to lowering cholesterol, lowering the risk for 5+ variations of cancer, reduced inflammation, and improved complexion. By blending the greens, the individual chlorophyll molecules are ruptured or broken, making the nutrients immediately digestible and easy to absorb. The body can then go to work; using the nutrients in the thousands of daily processes that occur. So, do something quick and easy for you and your family, make a smoothie and add a little green. ADVICE FOUND ON THIS WEBSITE IS MEANT FOR INFORMATIONAL PURPOSES ONLY, AND SHOULD NOT BE CONSIDERED MEDICAL ADVICE. CONSULT WITH YOUR DOCTOR FOR ANY AND ALL SERIOUS MEDICAL CONDITIONS AND BEFORE BEGINNING A NEW EXERCISE REGIME.